Ashes of Creation Apocalypse battle royale lobby screen. 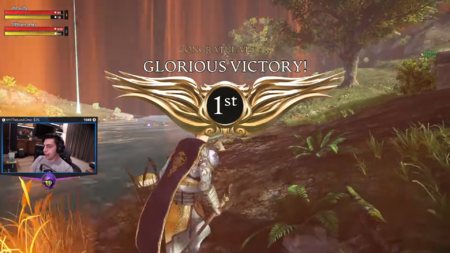 Ashes of Creation Apocalypse battle royale victory screen. Ashes of Creation Apocalypse battle royale (also referred to as Alpha-1 phase 1 battlegrounds, Alpha-1 arena or BR mode) is a Battle royale testing mode consisting of up to 100 players. This is a last man standing PvP combat mode. Weapons and armor found in the world have unique skills associated with them. These interact with the terrain from defensive, offensive and utility standpoints. Players can build buildings and structures such as watchtowers, defensive pillboxes and arcane structures. Everything in the world apart from rocks and trees is destructible. ↑ Livestream, 27 September 2018 (28:22). ↑ Livestream, 31 October 2018 (40:44). ↑ Livestream, 27 September 2018 (27:04). ↑ Livestream, 31 October 2018 (35:00). ↑ Livestream, 17 August 2018 (30:29). ↑ 7.0 7.1 7.2 7.3 Livestream, 1 September 2018 (56:11). ↑ Interview, 20 October 2018 (3:19:04). ↑ Livestream, 27 September 2018 (11:03). This page's content was last modified on 22 December 2018, at 12:15.